Rent ALL OR PART! Sitting across Main Rd from the Ruidoso River, these 5 newly remodeled, separate studio condos, all have full kitchens and baths.....Bamboo floors, Hickory cabinets, Poured Concrete Countertops and vaulted ceilings with plastered walls, gives you a clean, modern look while looking out over the Rio Ruidoso you will be able to see the river from some points on the deck , but you can almost always hear it....... You will have access to our REC room ( several other condo occupants have access to this room, so it is not you can "take it over" while you are there) that has a commercial spa, professional pool table, work-out equipment, gas log fireplace, Big Screen TV, WiFi, library, games, tables and chairs and coin-op perfect place for everyone to get together.... and when you're ready to relax in private, you're just steps away from your cozy, private studio. In front of the Rec Room there is a large deck for parties, wild life viewing, barbecues, or just simply to breath in the pure air and listen to the "river sonata" which you'll almost always hear. Each studio has it's own little deck too, if you only want to kick back in front of your unit and read that favorite novel. 2 of the studios have King beds, 2 have Queens, and 1 unit has a Queen and a Full. We can accommodate small weddings and parties (up to 50 people) too for an additional call Scott for details. My wife is 6th generation "Ruidosan". I moved here in 1988 and have been a licensed Realtor since 1990. We are raising two girls: Marley aged 14 and Sadie aged 11. We love the Upper Canyon and have owned this property since 2007. This is the perfect place to host a small wedding, corporate retreat, or family is a beautiful setting with indoor and outdoor you'll have options if the "weather" moves in! 6 private studio condos, all with private baths and there is a "Rec Room" with a large deck for everyone to get together. Yes...most beds have 500-600 thread count sheets. Wifi available in the Rec room and in all the units. All units have full kitchens with basic pots and pans...Put your cook in Unit 2 as that has the most big pots and pans. Very scenic and pleasing view of the Rio Ruidoso watershed.Lots of deer in the neighborhood....100 foot tall pine trees. Commercial spa available 24/7 in the Rec room. GREAT to know you enjoyed your stay with us.Hope you get to stay with us again soon. Thanks Again! We took a mini vacation to Ruidoso and stayed in a wonderful place. We each had our own room, but we were able to get together on the large porch or in the recreational room that provided something for everybody in our group. Thank you so much Scott and Roberta for a wonderful stay!! Thanks for staying with us! We are thrilled you enjoyed your visit! Thanks again!! 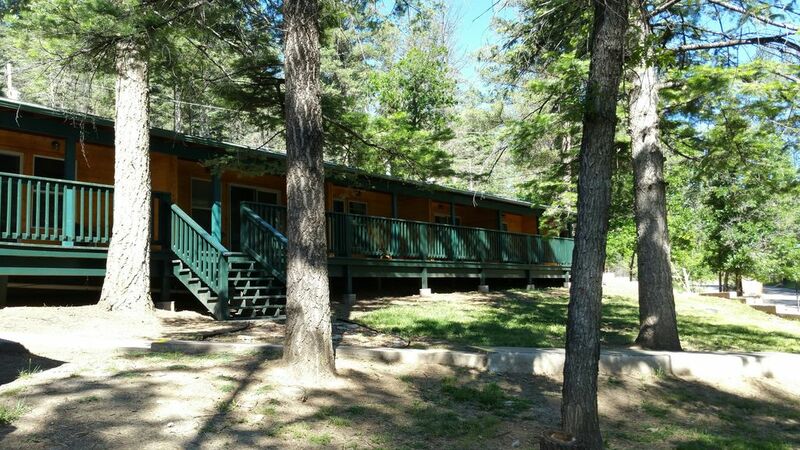 Great and spacious lodge in Ruidoso! We loved our stay here. This rented to us as 5 units, so we rounded up some friends and headed out. The common area of the lodge was very spacious, much bigger than we anticipated. The only downside was that you must go outside to get between the units and the common area. Overall we loved it! clean, great location and just plain awesome! The units were really clean and we'll maintained. The owners were always in touch making sure we were having a good time. Thanks for everything again. This is the best place we've ever stayed in ruidoso, we've been coming 3 to 4 times a year for 6yrs and by far the best set up properly for a large group, definitely will be back next year tnx! !